The Melbourne Cup is a 149 year old Australian Icon, it is the race that brings every corner of the nation to a stop. 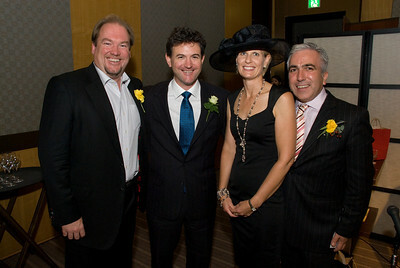 This year The Australia Society Tokyo’s 8th annual Melbourne Cup Event was held at The Grand Hyatt Hotel Tokyo attended by 165 guests, organisers Jodie Riley and Tony Scimonello had the day kick off at 11.00 am. The Ball room of the Grand Hyatt hotel was like being back home at the races, ladies dolled up to the nines wearing stylish hats and outfits, men in suits with yellow rose button holes the traditional flower for the Melbourne cup and this year being a public holiday we saw more men attending at the event which is normally held on a working day. Chef Budde and his culinary team at the Grand Hyatt had guests dining on Confit of Hokkaido salmon, Pearl barley risotto of seasonal mushrooms and the main course of slow cooked lamb shank on creamy mash potato and lentils. Dessert was a decadent macadamia nut tart and ice cream, topped of with mini lamingtons and coffee. The race was telecast via the internet, courtesy of Jim Edstein from DSTVASIA www.dstvasia.com. This year’s Fashion Show by up and coming Australian designer Leanne Yew www.tokyokaleidoscope.com was sponsored by Tokyo Physio. Andrew Dunlop the MC had people bidding for the Calcutta, followed by “Our Bookie” Rick Bower that had punters keen to place a bet on the race. Fashion on the Fields best dressed lady was Laura Greenshields, Best dressed male was Stephen Greenal.